This is the most sour porridge bread I've made to date. I think the 2 day rest in the fridge for the Einkorn and European Style flour starter may have contributed to it. 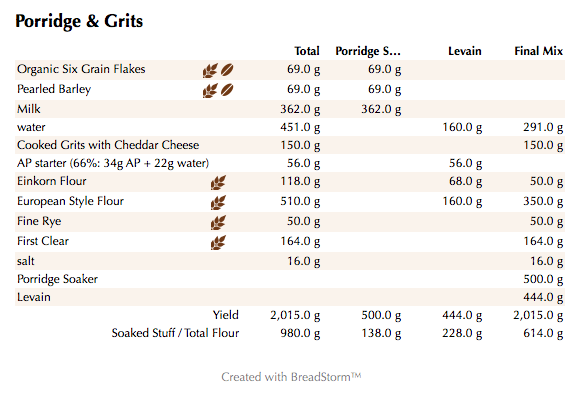 I used some pearled barley and Organic Six Grain Flakes from KAF for the porridge and added some cooked grits with cheddar cheese. I didn't measure the cheese added to the grits but it wasn't a large amount. Feel free to indulge. I always make a lot more grits than needed and eat them with dinner or breakfast later on. Note: Grits are 80% water and the water added for the final mix takes the 120 grams of water left over after cooking for the grits into consideration. I was actually going to add more water to the final dough but it didn't need it. 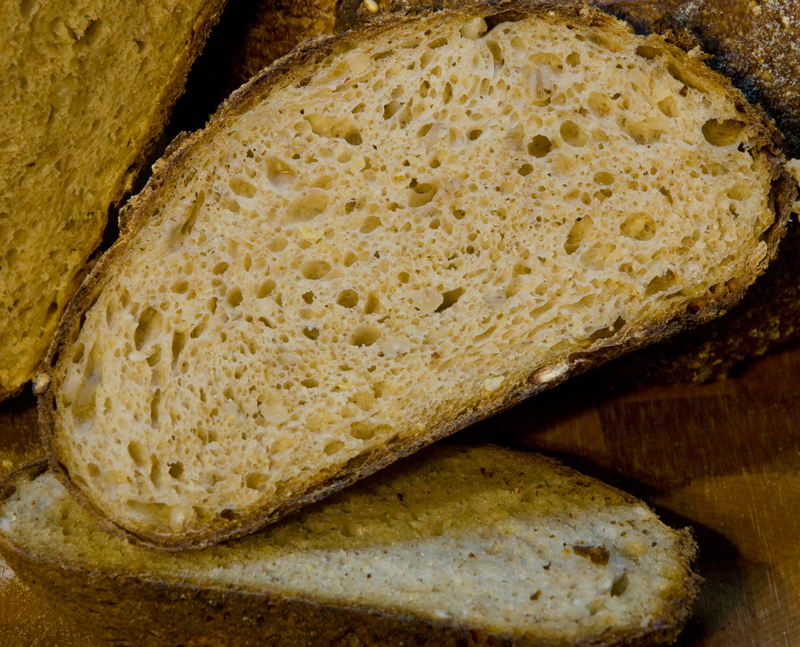 The final bread was excellent with a nice moist and open crumb which is expected from porridge breads. As I said before this one did come out a lot more sour than usual but it makes excellent grilled bread and toast and I almost wish I had kept both loaves instead of giving one away :). Mix the flours and the water for about 1 minute. Let the rough dough sit for about 20 minutes to an hour. Next add the levain, cooled porridge, polenta and salt and mix on low for 4 minutes and speed #2 for another 2 minutes or by hand for about 6 minutes. You should end up with a cohesive dough that is slightly tacky but very manageable. Remove the dough from your bowl and place it in a lightly oiled bowl or work surface and do several stretch and folds. Let it rest covered for 10-15 minutes and then do another stretch and fold. Let it rest another 10-15 minutes and do one additional stretch and fold. After a total of 2 hours place your covered bowl in the refrigerator and let it rest for 12 to 24 hours. (Since I used my proofer I only let the dough sit out for 1.5 hours before refrigerating). this bread tastes like. ha to be delicious with that long cold retard of the dough. We usually have shrimp on our grits southern style around here and shrimpy tasting bread would be a hard one to sell I'm thinking:-) The crust and crumb of this one are just perfect and there is some pretty fancy do scoring going on too. There is lot to like about this bread Ian. 'Well done! Lucy says hi to her buddies and hopes they aren't freezing to death. She wanted to mail them a box of AZ 80 F air but I nixed that. Thanks DA...I actually made a crawfish stuffed bread many years ago...more like a stromboli with craw-fish and cheese inside...it was quite good actually. Anyway, glad you like this one. 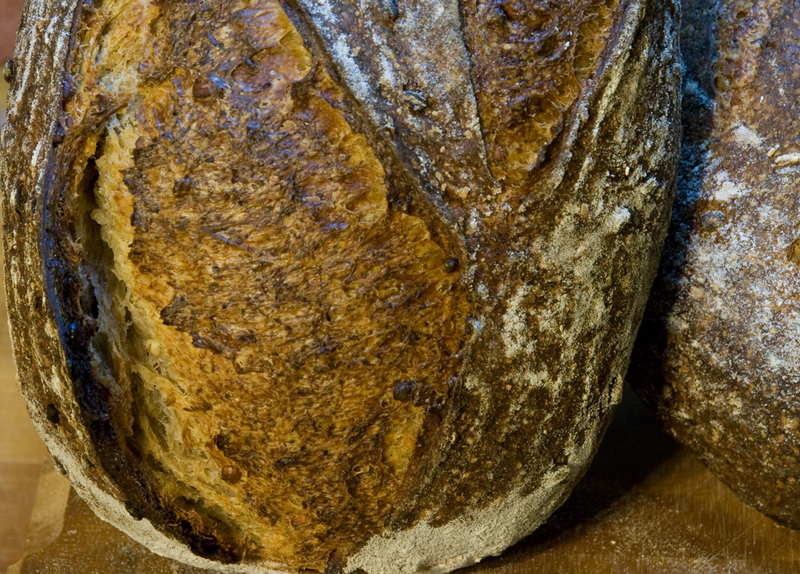 It was one of the more sour breads I've made in a while so I know you would be a big fan of this one. It's snowing right now....just returned from the dog park in the snow and getting ready for the blizzard. Could use that AZ air right about now. Great instructions and lovely crust and crumb. Glad you like it. Let me know if you try it and how it comes out. The only thing that can make this better would be some bacon. I would have a very hard time following that last line... Looks like your steaming procedure works pretty well based on that crust color! 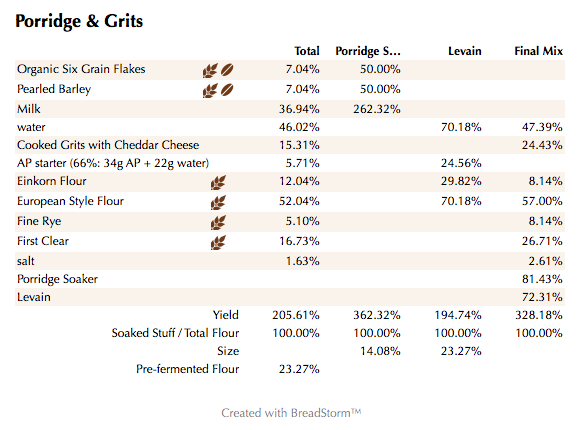 Ever considered dry-toasted the cornmeal for the porridge and omitting the cheese for a full grain flavor? I tried a polenta bread once and I think I just cooked the porridge too dry, so it aggregated a lot in the dough: next time will be much wetter porridge. I have never dried toasted the grits before, but that's an interesting idea worth trying. The wetter the porridge the better the crumb will be. Looks like a great bread! Thank you Karin. Always nice to hear from you. I think we need to come up with a new challenge bread to keep everyone on their toes.....any ideas? Hey Ian. Great loaves. Never tried porridge bread. 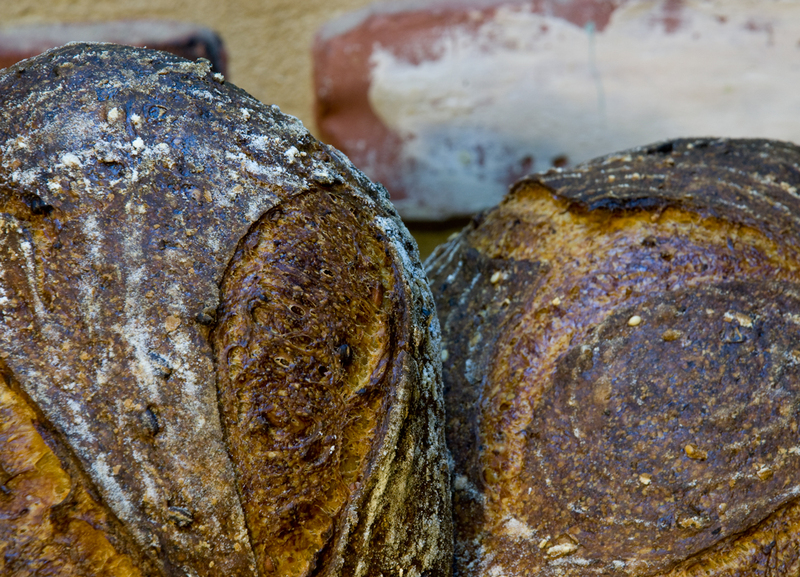 You got a great crumb and crust on them. Thanks for sharing the formula. When I get a little more time for baking I may gives these a try. Thanks John. Great to hear from you. Glad you liked the bake. I hope you get a chance to try it as I'm sure you won't be disappointed.